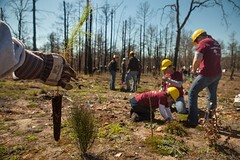 The Lost Pines Forest Recovery Campaign is more than a simple replant effort. After nearly 5 million trees were destroyed in 2011’s destructive fire, the campaign has become an effort involving not only many in the Bastrop community and county, but also outside support groups and organizations. In February, the campaign has seen a push from volunteers helping reestablish the forests of the 6,600-acre state park in Bastrop County. Replant initiatives such as the one led by Texas A&M University’s Aggie Replant organization is helping jumpstart regrowth in the park, according to a recent TAMU Times article. The Lost Pines Forest Recovery Campaign is a five-year replanting effort that will focus on the Bastrop State Park area as well as provide service to central Texans by contributing native tree species for replanting on private lands that may have also been affected by the fires. The recovery campaign is led by the Arbor Day Foundation, a non-profit organization, in coordination with the Texas A&M Forest Service and the Texas Parks and Wildlife Department. According to the Forest Service, the campaign is working to reestablish the trees to once again be a productive and healthy environment. Since the fire, native loblolly pine seedlings have been grown by ArborGen, a commercial nursery based in East Texas; the Louisiana Department of Agriculture and Forestry; Texas A&M Forest Service’s West Texas Nursery and the Lady Bird Johnson Wildflower Center, to be replanted in the destruction zone, according to the Forest Service. According to the Arbor Day Foundation, most of the seedling plantings to-date have been volunteer efforts. The campaign’s goal is to plant close to half a million seedlings within the next few months and its long-term plan is replanting 4 million seedlings. Texas A&M University’s Aggie Replant organization, a student-led environmental community outreach service organization, hopes to plant close to 30,000 trees itself in the state park during four separate sessions within the month of February. For more information, visit the Lost Pines Recovery campaign online, or read the full article at TAMU Times.